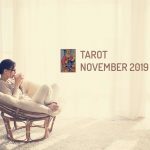 In Tarot for November 2019, The Hierophant is the arcana that dictates what will happen in the month and it represents beliefs, tradition and respect for existing moral norms. In any religion, the high priest is the most important person in the cult. It is what the Hierophant represents in the Catholic religion. The term Pontiff (from Latin pontifex) means bridge builder, the one that serves as a link between the material world of human beings and the spiritual world where God reigns. In Tarot for November 2019, The Hierophant represents the guardian of spiritual traditions and pushes us to act in the proper manner. That is, we can try to solve a problem or a situation that has been presented to us following the moral principles by which we are governed. We believe that our decision could be correct, but we are not sure. This card will tell us that we must act according to the moral rules that regulate the society we live in. It says to proceed in the same way that has always been done. This arcana is the card of spiritual values, of tradition and of identification with a concrete society. It is a positive card, which can indicate that we are wise, balanced people with moral values. Therefore, we will be able to give advice to others, so long as it is based on moral criteria and supported by deep intellectual reasoning. There are a couple of columns behind the figure of the Hierophant in the card. Unlike The High Priestess, who helps us communicate with hidden and feminine energy, The Hierophant transmits knowledge of a sacred nature, which is why the columns are not covered with the veil of mystery. It is revealing a path for us and The Hierophant represents the bridge between the material and the spiritual world. This card helps to indicate to us that on a professional level the teacher or boss that we would like to have is very likely to appear. Even if we are the ones to be called to do so, we will be able to due to our good judgment, solid principles and intellectual capacity. As for love, we will enjoy it in a traditional way, following the moral rules prevailing in our own individual society. Now is not the time to go against traditions. It is about love where one of the people acts as a protector, almost like a paternal or maternal figure. Romances may arise with older people who have great wisdom and intellectual capacity. Regarding health, if we have a disease we must strictly follow the doctor’s instructions regarding treatment if we want to be cured of it once and for all. We should always look for specialists who know the disease we went through well. The same thing will happen with money, where we will seek the advice of financial specialists by any means possible in order to avoid any risk. How we move our money will therefore be conservative and follow established rules and norms.